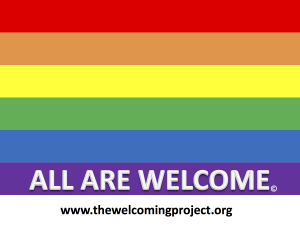 Looking for a FREE cardstock “All Are Welcome” rainbow sign from The Welcoming Project to let the world know you support LGBTQ people? Click the sign below and tell us your information and we will mail one over to you. How about a window cling? We ask for a $5 donation for our 4 inch x 3.5 inch opaque white static window clings. Please indicate your mailing address and how many you would like when you make your donation. Find even more merchandise at our online shop.